NPR's Ari Shapiro speaks with Eric Schwartz, president of Refugees International, about what he learned from Rohingya refugees in Bangladesh, after his trip to Cox's Bazaar. 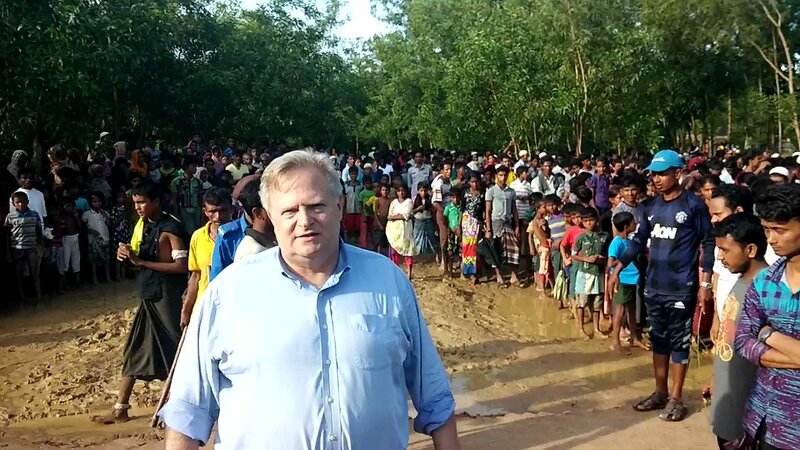 Eric Schwartz is seeing firsthand what's happening at the border of Myanmar in Bangladesh. He's president of Refugees International, and he arrived in the area over the weekend. I asked him to describe what he's seeing. ERIC SCHWARTZ: Well, Ari, the magnitude of the abuses perpetrated by the Burmese military is almost unimaginable. I've been on about - oh, I don't know - dozens of human rights and humanitarian missions over a 30-year career. And I've - I don't recall ever getting choked up until yesterday. SCHWARTZ: Well, the day before yesterday. After hearing - visiting a hospital with kids who had suffered gunshot wounds, burn wounds - 1-year-old, a 5-year-old, a 17-year-old girl. What we've heard repeatedly from everyone we've spoken to is a pattern of really horrendous abuses in the military surrounding villages, firing incendiary devices, people fleeing, people being shot at indiscriminately, villages being burned and just masses and masses of people going across the border. SHAPIRO: What you're describing sounds less like an effort to force people out and more like an extermination campaign. SCHWARTZ: There is no question in my mind that there are crimes - certainly, this is ethnic cleansing. And there are crimes against humanity that are taking place. Unquestionably a wide practice of atrocities - a textbook definition of crimes against humanity. It's shocking. It's even shocking for someone like me who has seen a lot of bad things over the years. SHAPIRO: Will you tell me the story of someone that you met in one of these camps, a story that'll stay with you? SCHWARTZ: Sure. At the risk of getting choked up, a very articulate woman from a village who fled with three young girls - ages I think about 7 and 5 and a young baby - whose husband urged her to get out of the village. And he said that he would follow. She was later told by other villagers who arrived in Bangladesh that her husband was shot but not only shot. He was shot through the head. And the look of resignation and - both resignation and anger was really just so affecting. So there was story after story. There was nobody we talked to - there's nobody we talked to who hasn't had a mother, a brother, a son, an uncle, some family member who was killed by the military. This is a horror story. SHAPIRO: They have fled to Bangladesh, a very poor country. What are the conditions right there where you are? Is it an organized refugee camp, or is it more ad hoc than that? SCHWARTZ: Well, it's very ad hoc. And these camps have been very makeshift. We're talking about 400,000 people, on top of as many as half a million Rohingya refugees who were already in Bangladesh. Probably roughly about half of the new arrivals are in these makeshift facilities. People are living in squalor, where, in the rainy season, mud is ankle deep. International aid providers are doing the best they can. And the government of Bangladesh is doing the best that it can. You know, there's a basic question here, which is, you know, has the government of Bangladesh recognized its responsibility to take care of these people. And at this point. The government of Bangladesh has said, yes, that this is a challenge it's prepared to take on. And that's extremely important. SHAPIRO: Eric Schwartz is president of Refugees International - speaking with us from Bangladesh near the border with Myanmar. Thanks for joining us.